We had some relief from the trials of tramping - because the canals were closed for maintainence we decided to get on bikes and do the 50K road walk to Twizel. There is a great new cycle path in this area that runs from Mt Cook village to Oamaru. So we had two great days on bikes cycling this new track to Ohau Lodge. Now the fact that we got there on March the 19th Lynne's birthday was either extremely good fortune on her behalf or very good strategic planning by the head of logistics... Lynne. 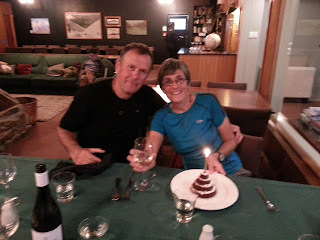 The staff at Ohau Lodge were fantastic and not only did they make Lynne a birthday chocolate cake but they donated the accommodation costs to Cancer Research. This once again was a real treat for us and a very humbling experience. From Ohau Lodge the Te Araroa heads up and over the Ohau range via Freehold Creek and the East Ahuriri Valley. This part of the tramp did present us with probably the roughest part of the tramp so far... As the decent down the East Ahiriri Valley, although poled has no trail on the ground. It's basically find your own way through the tussocks, spaniards and matagouri and plodge down the river when in doubt. 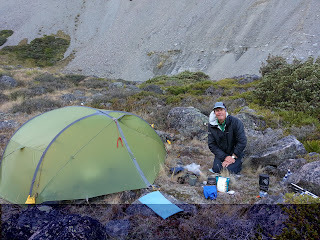 We camped this night in a stunning location, no sandflys and a full moon. An early start the next day saw us walking out into the magnificent Ahuiri Valley. If you have not been to this valley, you must visit it as we were blown away by the magnificent scenery. We had a major river crossing here of the Ahuriri river, however due to this stunning summer weather it never got above our knees. Couldn't imagine it in normal conditions. Stodys Hut...with a romantic fire!! From here, we continued our journey on an amazing 4 wheel drive track which climbed up and over Martha's saddle at 1710 metres and dropped us down all the way to the Top Timaru hut. These old musterers roads are an amazing feet of engineering and gritty determination. 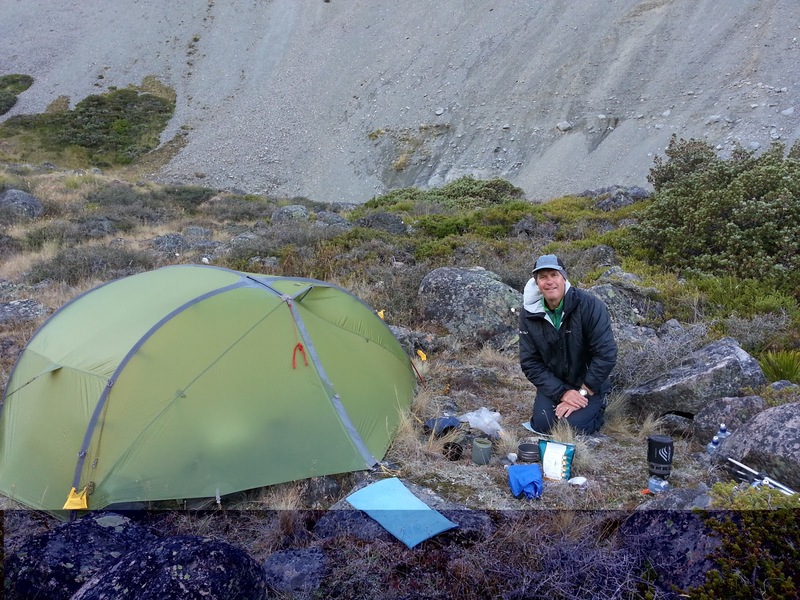 We stayed at the brand new top Timaru hut at this stage where we teamed up with Phil and Clare a young couple doing the Te Araroa as well. We had met them before on the trail when they had overtaken us the first time, however they had taken a break to watch the English cricket team in Dunedin for the first test match and had overtaken us for the second time!! The walk or should I say river adventure from the top Timaru hut to Stodys hut is not for the faint hearted once again we were thankful for the drought conditions as we had to cross the Timaru creek at least 14 times in pretty gnarly country. Unlike top Timaru hut Stodeys hut was a classic old musterers hut that had not changed in many many years, and as a result was overrun with little furry friends who visited us in the night. The huge positive of this hut was the beautiful open fire which we had roaring very atmospheric and a great place to stay. Next day, on to another 4 wheel drive track and the Lake Hawea station famous for its Merino sheep and a quick blast around Breast hill to the new Pakituhi hut with fantastic views over Mt Aspiring and Lake Hawea. The hut is perched just below a ridge line which you climb up to and plunge down 980 vertical metres to the Lake Hawea shore line. A knee trembler if ever there was one. It was so lovely on this decent to be met by Bill Clarkson, it was great to see him out on the hill with his musterers stick! He also told us that 50 years previous he had been mustering the Timaru Creek area... What a boy!! Bill Clarkson on the Breast Hill Track. Although in previous blogs we have have mentioned that the water in the Pelorus river was the clearest and then the Blue Lake, Lake Hawea and it's crystal clear waters proved so tempting that Lynne and I went in for a swim on two successive days. It was also wonderful to dive into Lake Wakitipu with Beth and it must have been 10 degrees warmer than Lake Hawea but not as clear. 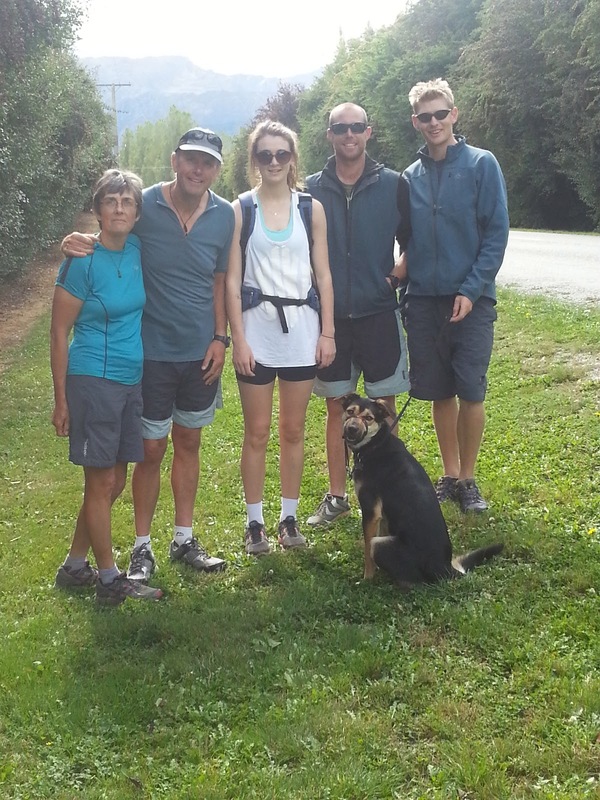 We have spent the last few days walking from Lake Hawea to Queenstown wharf doing all the flat easy bits and are just about to go back and do the Motatapu's which we didn't want to do over the busy Easter period. It has also been fantastic to have Beth with us carrying our pack !! and enabling us to do some long easy days on the flat. 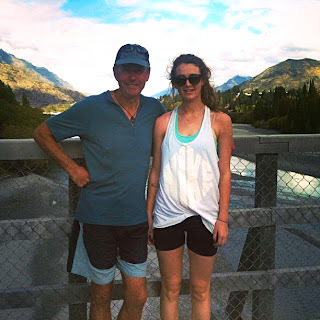 Beth is on an Easter break from Otago University and she is hoping to join us again perhaps for the last to days into Bluff in search of glory. Beth and Steve on the Historic Shotover Bridge. It has also been wonderful to stay with Dave Felstead, Kirsty and Ritchie Hunter and their awesome dog Crockett (Davie and Crockett). So onto the last leg of the walk and The Greenstone and Mavora Lakes. There is a rumour among the Te Araroa walkers that the best pies in NZ are to be found in Te Anau. Our next big decision is do we divert to Te Anau to sample the pies???? Dave, Crocket, Richie and Beth on the trail !!! Really getting close to the finish line now and hoping that this glorious weather will last but we really can't complain if it doesn't. Many of our friends that we have met on the trail and have overtaken us are all finishing in the next few days and will hopefully will come to find us on their journeys back north!! We have raised over $5,200 now for Cancer Research. If you feel like donating please click on the link to the donation site. Many thanks. Donate now to Cancer Research. Miles Pies, just around the corner from the mobile fish and chip van - my personal recommendation is the venison meat pie. Still has the antlers on, it really is that fresh. They might even do a lettuce and rocket pie for Lynne!! Well done the pair of you - not far to go now. Back in wintery Pembrokeshire yearning for the warmth and sun. It looks like you had a great time. I would love to stay in Queenstown. The place is such a beauty. Are there some accommodation in Queenstown wharf, near it? An adventure is what I need right now! Some trekking and hiking and definitely camping! I would really like someone who can give me some recommendation for some accommodation in Queenstown. We made it to Bluff!!!! A sniff of the ocean ! !